The English faculty at Reservoir is committed to providing experiences of literacy, literature and language that are both stimulating and enjoyable. At years 7-10, our English courses aim to develop students’ literacy levels as well as their abilities to express themselves articulately and effectively, think critically and appreciate literature in its many forms. Our courses reflect the new developments in curriculum for years 7-10 and provide a foundation for the later years of schooling where there are also changes to VCE English and Literature. Teachers are very keen to adapt courses specifically to the needs and interests of the students in their classes. Literacy support is available for students experiencing difficulties in reading and writing. In VCE English, teachers work very closely as a team to help ensure that our students have the opportunities to fulfil their potential in English. This is especially critical for students in terms of achieving their best possible ATAR and meeting the prerequisites for the vast majority of university courses. VCE Literature is also available as is VCAL English for VCAL students. Writing is an important part of our courses at all year levels. Students learn about and gain experience in the various forms of writing. Student work often appears in the school magazine and in displays for information nights. We work with students to ensure that they can express information, ideas and opinions clearly and effectively in a variety of situations. Reading and literature is the basis of all our English courses. Students are encouraged to read for their own enjoyment and to borrow from our well stocked library. In Years 7 and 8 students have a Wide Reading session in the Reading Corner which is part of the library. They can bring books from home or read library books. Students are also expected to read at home on a daily basis. We encourage our students to reflect upon what they read before completing response activities. During the year, a class will usually study at least one novel, some short stories a film and poetry or song lyrics. At Reservoir, year 7 – 10 students are required to purchase two texts, one of which is a novel. The other is usually a textbook which focuses on building literacy and language skills. VCE students are required to purchase all their English books and read them during the summer holidays. Students are expected to have their books from the start of the school year and are significantly disadvantaged if they don’t have the necessary resources and have not done the required preparation. Students undertake a wide range of activities in response to the texts studied. These activities involve them developing and sharing their ideas in both creative and formal ways. News, current affairs and the media are also studied, especially at years 9 and 10. We encourage our students to take an interest in what happens in Australia and around the world and how this is presented in the media. This links to their writing and listening and speaking activities and is a very important part of students’ preparation for VCE. We believe in helping our students to become strong communicators verbally, visually and in written forms. Students are involved in discussions, group activities, interviews, speeches, performances and debates. There is a growing emphasis on multi-modal communication using a variety of programmes and web 2.0 tools. Information and Communication Technology has become a very important learning and communication tool for students. The English faculty is actively exploring ways of using ICT in teaching and learning both in and out of the classroom. Students learn to use this technology to generate, organise and present their ideas and communicate them effectively to an audience. We have a strong VCE English and EAL programme. VCE Literature has also proved to be very popular for those who’ve developed a love of literature in its different forms. For students who have particular skills or interests, there are opportunities for students to become involved in debating teams, film studies, writing competitions, drama electives and the school production and public speaking occasions. There are also a variety of possibilities for enjoyable and educational excursions to support student learning. Students in years 7 – 10 undertake common assessment tasks during the course of the year and year 10 students also do end of semester exams. 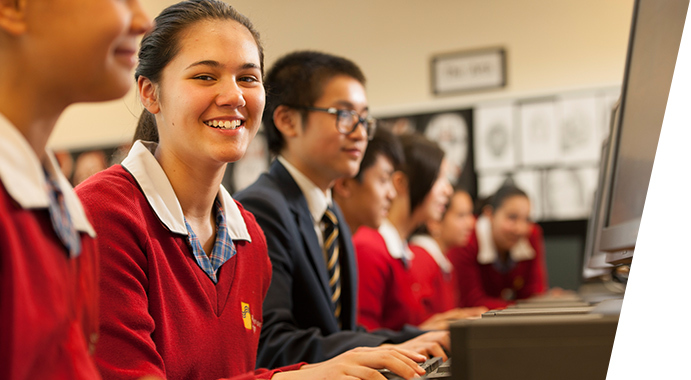 VCE students also undertake common assessment tasks and SACs as well as exams. We encourage students to take assessments seriously and to prepare conscientiously in order to achieve to the best of their abilities.